Third National Climate Assessment says climate change is hurting the U.S. That’s good news. 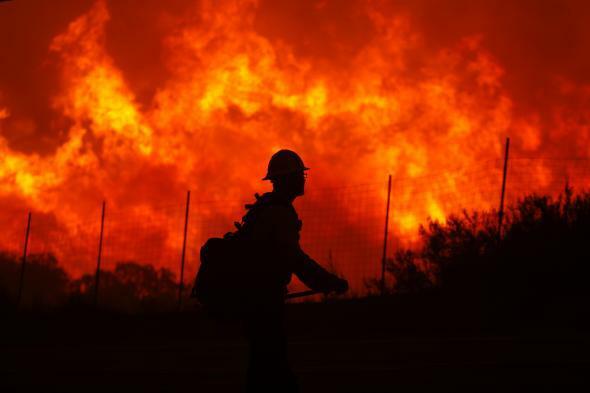 A wildfire burns nearly 20,000 acres in California on June 1, 2013. Yesterday a federal advisory committee issued a major report on “Climate Change Impacts in the United States.” The report has good news and bad news. The bad news, as Slate’s Phil Plait explains, is that climate change isn’t a scenario anymore. It’s happening, and it’s inflicting pain across our country. The good news is that pain is healthy. Seeing and feeling the damage we’re doing are what will finally make us deal with the problem. In general, people don’t face their problems till they have to. They like to have a good time and ignore the costs. Liberals tend to notice this bad habit in the context of public goods problems, such as pollution. We dump chemicals and leave the consequences to others until our water becomes undrinkable. Conservatives tend to notice the same habit in the context of spending. We treat ourselves to entitlements we can’t afford, and we leave the bill to our kids. In daily life, accountability mechanisms usually limit the damage caused by this weakness. But the harm can get out of hand when those mechanisms are absent. That’s what often happens to entitlement programs: We use creative accounting and the power of the printing press to postpone the reckoning that would otherwise force us to cut back. The longer we postpone the pain, the worse the problem becomes. In politics, pain is just a metaphor. But in medicine, it saves lives. A patient who doesn’t feel the warning signs of cancer or heart disease is far less likely to survive. So is a patient who experiences symptoms but ignores them. Your best chance is to face the problem and take action early. And what’s most likely to push you in that direction is pain. That’s why this awful climate report is good for us. Climate change is arguably the most dangerous procrastination episode in the history of the world. We’ve been building up greenhouse gases for more than a century, at first ignorant of the consequences, and then unwilling to confront them. The stakes are catastrophic, but they’ve always seemed far away. You gas up your car or crank up your air conditioner, leaving the misery of an overheated planet to somebody else’s grandkids. And because the effects of today’s emissions are baked into the future, every year we dawdle raises the baseline level of harm—regardless of what we do in the interim—that much higher. What’s insidious, psychologically, is the lag time between the self-destructive behavior and the self-destruction. Summers are longer and hotter, and extended periods of unusual heat last longer than any living American has ever experienced. Winters are generally shorter and warmer. Rain comes in heavier downpours. People are seeing changes in the length and severity of seasonal allergies. … Residents of some coastal cities see their streets flood more regularly during storms and high tides. Inland cities near large rivers also experience more flooding, especially in the Midwest and Northeast. Insurance rates are rising in some vulnerable locations, and insurance is no longer available in others. Hotter and drier weather and earlier snowmelt mean that wildfires in the West start earlier in the spring, last later into the fall, and burn more acreage. The report goes into geographic detail, linking climate change to afflictions in each region: heat waves in Texas, Oklahoma, and the West; floods in the Midwest and Northeast; droughts in the Southwest; hurricanes and storms along the Gulf Coast and in the North Atlantic. The links are a matter of increased probability, not direct causation. But the effects don’t have to be depicted in an artist’s projection of the future. We’re feeling them now. Because human-induced warming is superimposed on a background of natural variations in climate, warming is not uniform over time. A recent slowing in the rate of surface air temperature rise appears to be related to cyclic changes in the oceans and in the sun’s energy output, as well as a series of small volcanic eruptions and other factors. Nonetheless, global temperatures are still on the rise and are expected to rise further. I’m grateful for those volcanoes, but they can’t bail us out forever. We have to act before it’s too late. Bring on the pain.